We are a major Pilma Powder Manufacturer and Supplier in Mumbai, Maharashtra. 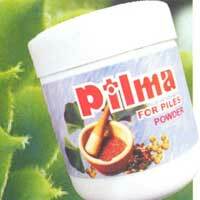 Pilma Powder is formulated from the natural herbs that are procured from the trusted vendors in the market. Advised by doctors, Pilma Powder provided by us facilitates easy digestion and a smoothing sensation is felt in the affected areas. Also, motions are passed out without any pain thus, restoring lost energy and vigor to the body. Our Pilma Powder is suitable for every age group and is very effective in getting relief from all types of Piles. Suitably packed, Pilma Powder is available at affordable prices.